100% cotton cap in faded blue. Hand distressed with a vintage Goodyear patch. Adjustable with a brass fitting closure. One size fits most. A little history on Vintage Goodyear . . . In 1898, Frank Seiberling established the Goodyear Tire and Rubber Company in Akron, Ohio. The company was named for Charles Goodyear, the man who developed vulcanized rubber. Seiberling borrowed 3,500 dollars from a brother-in-law to purchase the company’s first factory. Goodyear originally employed thirteen workers, but the firm quickly emerged as a leader in the production of rubber items, including bicycle tires, pneumatic carriage and automobile tires, horseshoes, and hoses. By 1926, Goodyear was the largest rubber company in the world. David Hill, who purchased nearly one-third of the 100,000 dollars worth of stock that the Goodyear Tire and Rubber Company issued in 1898, became the company’s first president. The company went through two additional presidents before Seiberling became chief executive in 1906. The founder of the company remained as the firm’s president until 1921, when an economic recession prompted him to resign. Seiberling personally developed the company’s logo — a winged foot — the same logo that the Goodyear Tire and Rubber Company utilizes in the twenty-first century. Goodyear led the industry in the development of new products. In 1903, the company developed the first tubeless automobile tire. In 1909, the firm branched out into the aviation industry, producing the first airplane tires. Before this point, pilots primarily utilized bicycle tires on their planes. Three years later, Goodyear produced its first blimp. In 1919, the firm also developed the first bulletproof gas tank for planes. The company continued to lead the industry in creating new products throughout the twentieth century. While the Goodyear Tire and Rubber Company prospered, its workers sometimes suffered. In the late nineteenth and early twentieth centuries, factory workers faced poor working conditions, low wages, and almost no benefits. This was true for the workers employed by rubber manufacturers in Akron, Ohio, such the Goodyear Tire and Rubber Company, B.F. Goodrich, and Firestone Tire and Rubber Company. 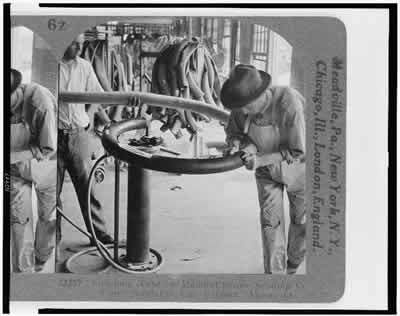 In an attempt to alleviate their conditions, workers established a union named the United Rubber Workers in 1935. The following year, this union organized its first major strike within Akron’s rubber industry. The strike began as a protest against a plan created by Goodyear to reduce wages and increase the pace of production. The workers utilized the concept of the “sit-down” strike. In the past, when workers went on strike they would leave the factory to join picket lines. Company owners often hired “scab” laborers to cross the picket lines and continue production. The practice of using scab labor made it difficult for striking workers to obtain their demands. In contrast, in a sit-down strike, workers quit working but still occupied their places within the factory. This process meant that the factory owners could not send in additional workers to continue the job. In addition, factory management was more reluctant to use private security forces or other strikebreakers to intimidate the striking workers, as that approach threatened destruction to plant property. In addition to the sit-down strike, the rubber workers also organized long picket lines in protest. Akron’s mayor, Lee D. Schroy, attempted to send in the police to put down the strike, but the police officers refused to do so when they faced the thousands of organized workers. In the long term, the rubber companies were forced to recognize the United Rubber Workers and negotiate better contracts with workers. One immediate success was a six-hour workday. Several reasons existed for the workers’ success in this strike. First, sit-in strikes made it much more difficult for employers to replace their striking workers. Equally as important in this strike was the federal government’s recent passage of the Wagner Act. This legislation made unions legal for the first time in United States history. Finally, the United Rubber Workers belonged to a larger organization, the Congress of Industrial Organizations (CIO). The CIO consisted of an umbrella organization for multiple unions. These unions worked together by providing both moral and material support to CIO-member unions, especially when these member unions went on strike. In 2003, the Goodyear Tire and Rubber Company sold more than thirteen billion dollars worth of products. The firm employed more than ninety-two thousand workers. It had plants around the world and remained the largest tire manufacturer in operation. – “Goodyear Tire and Rubber Company. “Goodyear Tire and Rubber Company – Ohio History Central.” N.p., n.d. Web. 14 July 2017.